What Is a GPS (Global Positioning System)? Home Other Articles GPS: What Is a GPS (Global Positioning System)? Global Positioning System satellites orbiting the earth at a distance of 10900m continuously transmit information on two UHF L band frequencies, a course acquisition ranging code (the C/A code) on 1575.42 MHz and an encrypted precise positioning service code (the P code) on 1227.6MHz. The GPS system comprises a Space segment (the satellites), a User segment (the receivers) and a Control segment (the ground stations). 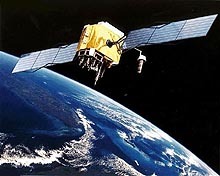 A minimum of four satellites are necessary to correct for the clock error in the GPS receiver and to obtain a timed (UTC) position fix. Coordinates of latitude and longitude (waypoints) are plotted on a moving map display in the form of a track, accurate to within 10m. Numerous waypoints may be selected as destinations and a displayed magnetic compass rose with needle may be selected to point to the destination, indicating current ground speed, magnetic heading, EET, ETA, altitude and distance to run to the selected waypoint. The GPS system is line of sight and covers the entire planet. Accuracy is determined by the word bit length of the encrypted service code and is currently restricted to approximately 10m.